As a foreign language teacher I am always in search of ways that I can encourage and monitor peer-to-peer conversations with my students. With large classes sizes, it is impossible for me to monitor all “turn-and-talk” or partner speaking activities. 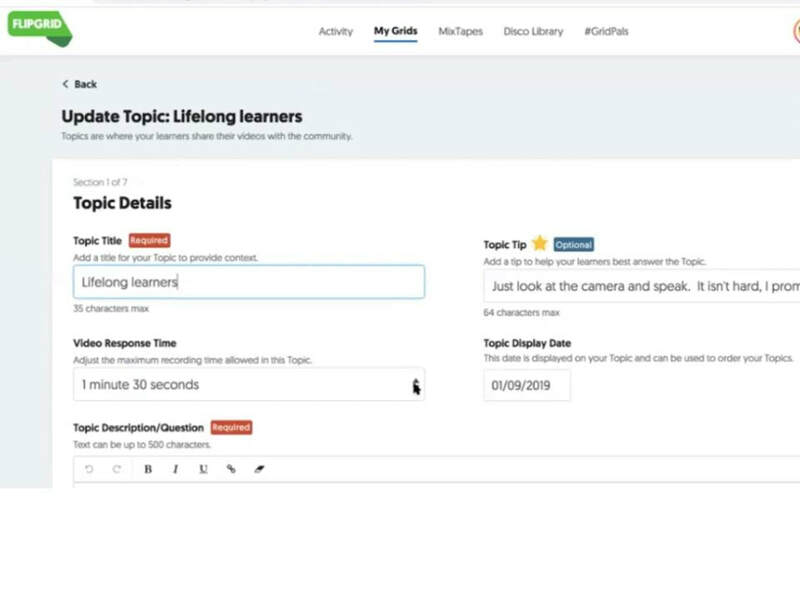 Flipgrid allows students to facilitate short pre-recorded conversations in Spanish (or any other language) while allowing students to prepare and reflect on their own speaking skills. This tool allows both for the modeling of personal communication and expression while also providing a unlimited “do-overs”. FlipGrid feels so natural for students to use because its interface is similar to tools they already are familiar with such as Snapchat. I believe that it is partly the reason FlipGrid has been such a successful tool in my classroom. Flipgrid is the leading video discussion platform designed to amplify student voices. Students can access grids on any device that has access to the internet and a camera- laptop, ChromeBook , tablet, or a phone. As the teacher, you are the topic designer and start each grid with a prompt. If you are having trouble thinking of a relevant topic or what to begin with Flipgrid curates a Discovery Library with thousands of topics appropriate for all age and content levels. These can quickly be set up as topic in your grid for students. You are able to host multiple grids across several classes all with many different topics. The best part of about Flipgrid is that it is free to all educators. I began using Flipgrid in my classroom in September 2018. In these past four months my 6, 7, and 8th grade students have logged 20 hours and 28 minutes of engagement time. I have spent the most time developing Flipgrid activities for my Foreign language classes. Speaking skills and the ability to express your opinion and personality are essential communication skills. In Spanish, students are often frustrated by their limited language skills or are embarrassed to speak in front of their peers. Flipgrid gives them the support needed to gain confidence in speaking, while also increasing their time speaking the language. Speedbumps: It does take students som time to record their video responses, especially with multiple “do-overs”. Students can also get easily distracted trying to take the perfect selfie pic. Possible Solutions: I allow my students to use stickers in their selfie so they can enhance or hide those things that make them self-conscious, the stickers also tell me a lot about their individual personalities. I also recommend setting firm time limits and showing some of the first completed videos. This motivates most students to “just pick one” and move on. Note the selfie is the last step and they have already recorded their video at this point. 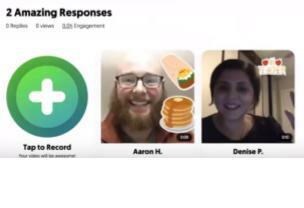 Despite these frustrations, Flipgrid has proved to be a unique tool that allows me to effectively assess my students speaking and listening abilities in their foreign language while increasing peer to peer interaction in the target language. Below is a summary of key features, benefits and procedures that work for me. Grids can be domain or password protected. Students have a means to review their work before submitting their final video. Once posted, students cannot delete their own posts (as the host and administrator I can mute or remove items, but they cannot). In my opinion this alleviates some of the risk of potential bullying because I can see an monitor it all. Students have a means of following up with each other and have to apply their listening skills in order to do this. The technology is easy to use and review. Students can personalize their posts and use features they have on social media like stickers. You can freeze topics or grids until you have time to grade or review all videos. Post original prompt with various methods of scaffolding. Allow them to be a little bit silly (one sticker, one pose…) the more they are allowed to have fun, the more they will be willing to invest into the task. Let them review and re-record their videos before they are taken for any kind of grade other than completion. Allow students to like each other’s videos while waiting for all students to post within a specified time limit. If your classroom has a projector, show the first couple of videos to the whole class while others finish. Have students follow-up with a comment or question to the video of the student before and after their in the grid. Grids can be worked on over several days or assigned as homework. If I am stretching over more than one day, I will respond with a personal message to each student- this can also allow absent students a class period to catch up. Review videos and give general feedback about the conversations to the whole class. Then have students review their video and give them time to re-record based on your feedback regarding content, pronunciation, or grammar errors (self-editing) before scoring the recording as a listening and speaking rubric. You can create your own rubric in Flipgrid. Students are able to re-record their voices easily, so they spend more time paying attention to the pronunciation of words in Spanish. The fact that their videos will be viewed by their peers has created intrinsic motivation to improve their speaking abilities. For example in this task my students told me about their favorite classes. I experimented here, and did not give them a lot of vocabulary introduction and let them jump in. They asked me and their fellow students how to pronounce words and created some simple but effective communication. I can provide scaffolding in the tips section. I also record my video first so that students can listen to my pronunciation. Absent students can easily catch up to the conversation as we work on a topic over the course of several class periods. In addition to using Flipgrid in my foreign language classroom, I have used this tool to allow students to summarize or apply a Bible story to their own lives. My math students created longer videos, 1.5 minutes, in which students “teach” their Math word problem. This replaced a class presentation and generated greater interest in the activity. Students worked together to produce the best possible products and help each other edit and record their work. This was part of a formal learning assessment. Denise has taught at St. Mary Interparochial School in Center City since 2007. She currently teach grades 6, 7 and 8th Spanish and Honors Math. She also currently teaches 6th grade religion. When she's not in school she loves spending time with her husband and two children. 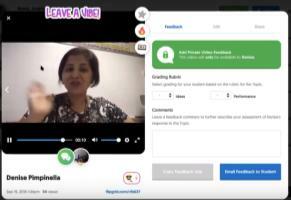 AoPTech would like to thank Ms. Pimpinella for sharing her FlipGrid experience with us.